The mission is being utilized by the community practically all day everyday. 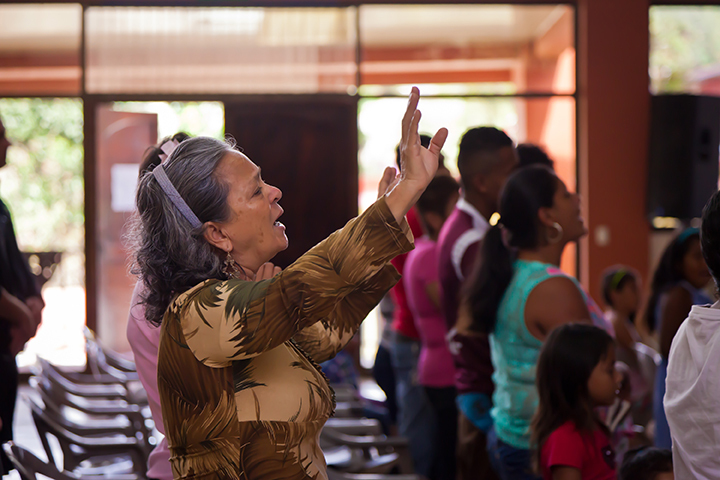 Our ministry schedule is packed so that every group of people within Bajo Tejares can have a special time to meet and grow their relationships with God. Here is a taste of what’s happening each week at the mission. We hold a church service where everyone in the community and beyond is welcome to attend. While the service is taking place, children of all ages are welcome to take place in Children’s Church where they are separated into groups by age and are taught a weekly lesson in their Sunday school classes. Once a month, we hold a community lunch after the service as a time to not only provide a meal to families in need, but to also provide a much needed time of fellowship for the congregation. The women of Bajo Tejares meet on Monday evenings. This group is led by Nathaly, Pastor Brian’s wife. She volunteers her time each week to help the ladies study the Bible, understand it, and apply it. The women take part in a variety of activities on Monday nights such as singing, dancing, small groups, arts and crafts, and fellowship time. Every other week, the teen girls meet to have a special time to focus on things that effect their every day life. Topics are geared specifically towards the girls and are more easily discussed outside of the entire teenage group of both male and female students. The men’s group meets Tuesday evenings. This group started out small but is gradually growing. The fathers of Bajo Tejares are often absent, making this group vitally important in teaching the men how to lead their families in a Godly way. Each new member is huge progress. The men normally have open discussion about relevant topics while enjoying coffee and a light snack. On special occasions, the men’s group enjoys grilling out and having a meal together. Our youth group for students who are 11 - 17 years old meets on Wednesday nights. This group is led by the Pastor along with several of the FSM young adult ministry who assist him and serve as role models to the younger kids. They often play games, receive a message, and have hangout time. Generation 7 or "Gen7" is our newest ministry, created for young adults ages 18-25. This ministry was designed for those who are no longer considered youth, but who still appreciate a more dynamic style of teaching. The idea of this group is to discuss themes that are relevant to the age group, but in a more interactive manner. This group currently meets the first Saturday of each month.